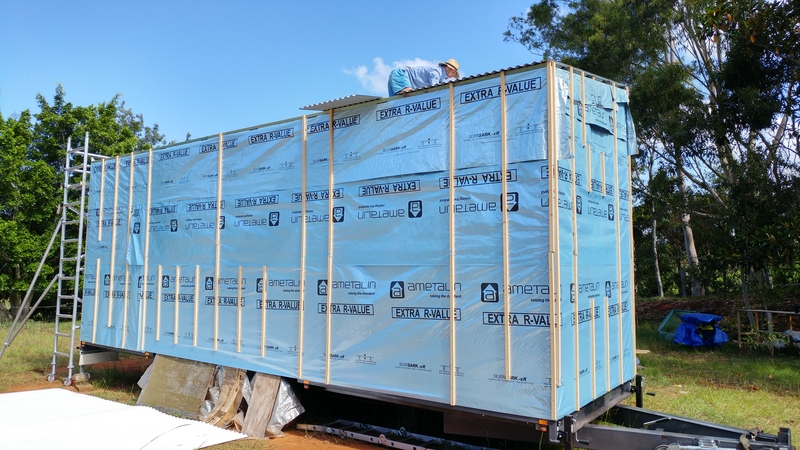 With our THOW all wrapped in building wrap and the roof battens bolted on, it’s now time for us to move on to the next step: installing the tiny house roof! 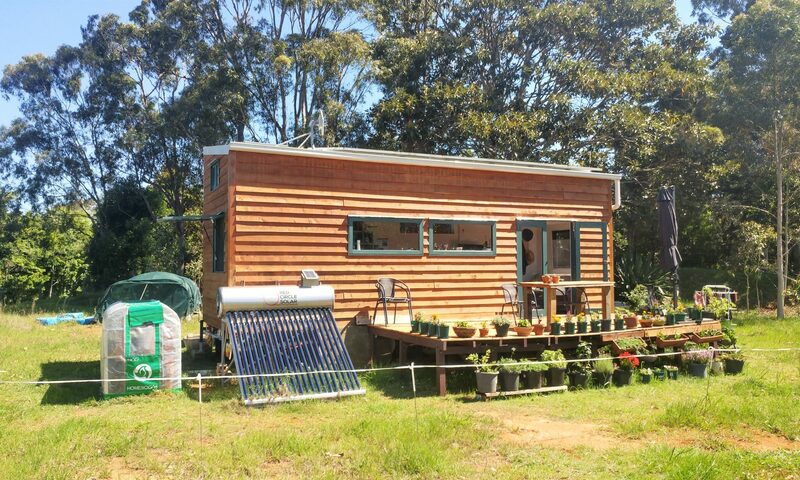 What is the right kind of roof for my tiny house on wheels? Unfortunately, there is no unique answer to this question. There are so many different types of roofing materials out there. Also, every tiny house roof is different. That’s why I think that the answer depends on individual preferences and needs. But there are some important criteria which will make choosing a tiny house roof easier. Those criteria can be weight, height, climate, aesthetics and costs. The most important criteria for us are weight are height. We don’t care so much about colour or the overall look of our roof because we will cover it with solar panels. So most parts of the roof won’t even be visible. 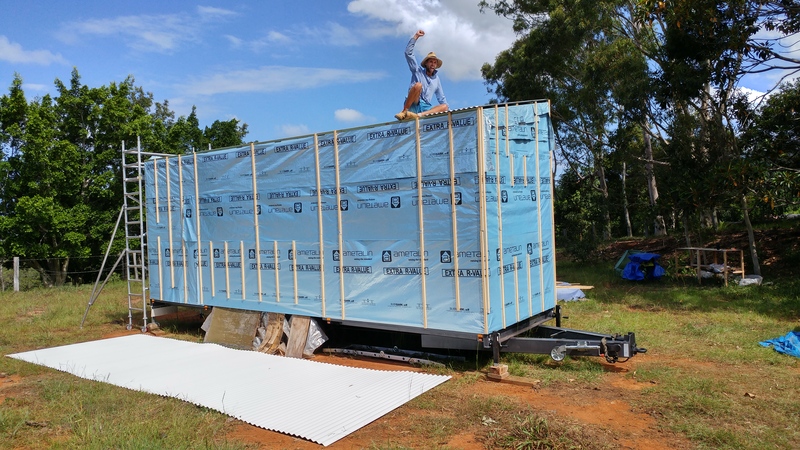 Instead, we’re looking for a lightweight material which is as flat as possible so we’re not going over the maximum height of 4.3 m. Weight and heights of our tiny house always seem to be our number one concern. But if we want to be able to move our tiny house those two are crucial. During our research, we stumbled across a company here in Australia called Lysaght. They’re specialised in corrugated iron roofs. We went with the “Custom Orb” series of corrugated iron sheets and chose the colour “surf mist”. We’re quite happy with our choice because the sheets are lightweight and flat. Exactly what we wanted! Installing the sheets onto our tiny house roof was surprisingly easy. Before lifting the sheets up onto the roof we did a dry run on the ground to make sure we’re installing them correctly. So we laid them all in a row on the ground in the same way we would bolt them to the roof battens. Then we lifted them up and bolted them on one by one. In the end, it just took us a couple of hours to install our tiny house roof and to get it waterproof! Another good thing about Lysaght is that the panels come with detailed instructions on how to lay and install them. Also, their website is very good and packed with useful tips and videos. We also ordered our flashing from Lysaght and learned that flashing is always custom. So we ended up with four metal pieces of flashing which we had to cut and fold a little bit to fit our roof. But it’s really simple. Once we were happy with the fit of our flashing we just screwed in on with metal screws. Done!